"It's the best... SwampFest!" is back again to celebrate and showcase local original music. 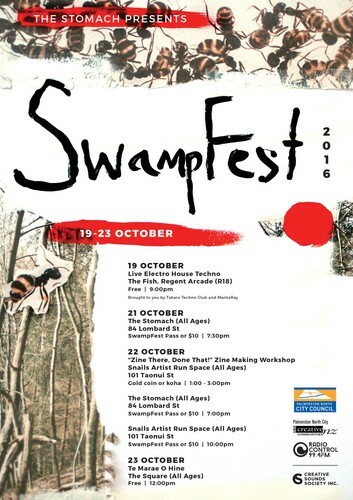 With over 20 local performing artists on the bill this year, Creative Sounds a.k.a The Stomach is proud to bring you SwampFest 2016 from Wednesday the 19th to Sunday the 23rd of October. Free. 9pm. Brought to you by Takaro Techno Club and MantaRay. SwampFest passes will be available from The Stomach, or on the door at either of The Stomach shows. Your SwampFest Pass will get you into all three of the shows with cover charges on the 21st and 22nd for only $15.00! SwampFest 2016 is brought to you with the generous support of Radio Control 99.4FM, Palmerston North City Council, and the Creative Communities Funding Scheme.